The Late Shri Rajiv Gandhi, remained even till his end, the epitome of youth leadership. The Rajiv Gandhi Shiromani Award is instituted to recognize young achievers who have helped make a difference in various walks of life. Junain Nazri, the young and dynamic CEO of Briskon Software Consulting, is the proud recipient of the Rajiv Gandhi Shiromani Award 2013 for his incredible contribution to the industry and business. Junain received the award from the His Excellency, Dr. Devanand Kowar, Governor of Tripura, at a glittering function held on 18 August 2013 at Teen Murti Bhavan, New Delhi. The other prominent dignitaries included Hon'ble former Governor (Sikkim) Ch. Randhir Singh, Hon'ble former Governor and Union Minister Dr. Bhishma Narain Singh and Former Chief Election Commissioner of India Dr. GVG Krishnamurthy. 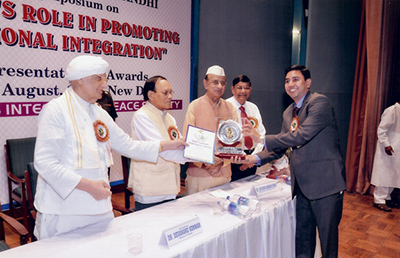 The awards were given away during a symposium conducted by the Citizens Integration Peace Society to commemorate the 69th birth anniversary of the Late Shri Rajiv Gandhi and carry on his legacy of inspiring youngsters to actively participate in nation-building. Junain, a first generation entrepreneur, founded Briskon in 2005, and within a span of less than a decade, grew the company both in terms of size and scale to today become a leading software consulting and development organization. Briskon today had presence in several countries, serves customers around the globe, and is a name to reckon with in the IT industry. The Rajiv Gandhi Shiromani Award is yet another feather in Junain’s cap. He has earlier been conferred the Indian Leadership award, Mother Teresa Excellence Award in 2011 and the Bharat Gaurav Award, also in the same year. Briskon Software Consulting Pvt. Ltd. is a software consulting and IT application development company headquartered in Bangalore, India. Founded in 2005, Briskon is a privately held company with a successful track record of delivering excellence to its global clients. Briskon’s well-rounded team, comprising highly skilled managers, analysts, developers, and QA personnel, works together to deliver world class IT products and solutions. Our unerring commitment to quality and continuous learning to stay abreast of the latest technologies enables us to consistently deliver superior quality and customer delight.